The recent high oil prices have focused research attention to alternative routes and feedstocks for the production of light olefins. The former was caused by two reasons: on the one hand the high oil demand from new economies, on the other hand the growing awareness of the declining oil reserves. Many scientists claim that global production of oil is set to peak in the next decade before entering a steepening decline. According to this &'peak oil&' theory, our consumption of oil will catch, then outstrip our discovery of new reserves and we will begin to deplete known reserves. Equally important for steam cracking is the fact that these oil fractions contain less naphtha, i.e. the main feedstock for ethylene and propylene production, because of their heavier nature. Hence, even if we ignore the fact that these reserves are more difficult to reach because of their deep sea or Polar region location, alternative routes for the production of light olefins should be considered. The use of renewable feedstocks is also encouraged by the growing awareness about the greenhouse effect,2 which is now generally recognized as being caused by the use of fossil fuels. The use of biomass for energy, fuels or chemicals is essentially carbon neutral. Carbon dioxide released during the energy conversion of biomass (such as combustion, gasification, pyrolysis, anaerobic digestion or fermentation) circulates through the biosphere, and is reabsorbed in equivalent stores of biomass through photosynthesis. A promising route for the production of ethylene from wastes and renewable fractions is the combination of the Bio-Synfining™ process with a traditional steam cracker. Syntroleum's patent-pending3,4 Bio-Synfining™ process catalytically converts the triglycerides and/or fatty acids from fats, algae and vegetable oils to a high quality synthetic paraffinic kerosene (SPK) or diesel and a renewable naphtha in three steps. First, the raw feedstocks are treated to remove catalyst poisons and water. In the second step, the fatty acid chains are deoxygenated and transformed into mainly paraffins in a hydrotreater. For most bio-oils, fats, and greases, the hydrotreater liquid product consists mainly of C15-C18 paraffins. In the third step of the process, these long straight-chain paraffins are hydrocracked into shorter branched paraffins. The hydrocracked products fall mainly in the kerosene and naphtha boiling range. The current contribution will discuss on the one hand details about the Bio-Synfining™ Process for production of naphtha, including process technology, production capacity and economics. Also recent progress on the Dynamic Fuels bio-refinery, scheduled for startup in early 2010, will be reported. The latter uses Syntroleum's Bio-Synfining™ Technology to convert animal fats and greases provided by Tyson Foods to naphtha and kerosene/diesel. On the other hand the contribution will discuss the results of an extensive steam cracking pilot plant campaign performed with renewable naphtha from the Bio-Synfining™ process. This study was performed on the pilot plant of the Laboratorium voor Chemische Technologie 5,6 (LCT) in Ghent university and involved the detailed characterization of the naphtha using GCxGC TOF-MS and GCxGC FID important for addressing the quality of the produced naphtha (detailed PIONA, sulfur, nitrogen and oxygenates content, etc.). Cracking of the renewable naphtha leads to high light olefin yields and low amounts of aromatics. For a residence time of 0.4 s, a Coil Outlet Pressure (COP) of 1.7 bar, a dilution of 0.45 kg steam per kg hydrocarbons and Coil Outlet Temperature (COT) of 850°C, the renewable naphtha gives an ethylene yield of 31 wt% and a propylene yield of 17.5 wt%. The absence of a significant naphthenic and aromatic fraction in the feed results in low C5+ yields, low amounts of pyrolysis gasoline and an almost non-existing amount of pyrolysis fuel oil. The influence of the process conditions on the product yields is as expected.7 At higher severities more methane, ethylene, 1,3-cyclopentadiene, benzene and toluene are formed. The propylene yield is highest at a COT of 820°C. Higher dilutions result in higher light olefin yields and lower amounts of C5+ products for identical process-gas-temperature profiles. Comparison with results obtained of several oil derived naphthas shows that the renewable naphtha can be considered as a very attractive feedstock for a steam cracker. The latter is confirmed by coking runs [COT = 850°C; d = 0.45 kg/kg; COP = 1.7 bar] with and without DMDS addition and comparison with coking data of reference feeds. The renewable naphtha has a low coking tendency, and long run lengths can be expected. The results obtained in this study are scaled-up to industrial furnaces (Lummus SRT-VI, Millisecond, USC Shaw Stone&Webster) using COILSIM1D8,9, resulting in product yields and run lengths for a typical range of industrial operating conditions. 1. Hirsch, R. L.; Bezdek, R.; Wendling, R. Peaking of world oil production: impacts, mitigation, & risk management; Department of Energy: Jan 1, 05. 2. Houghton, J. T.; Ding, Y.; Griggs, D. J.; Noguer, M.; Van der linden, P. J.; Xiaosu, D. Climate Change 2001: The Scientific Basis: Contributions of Working Group I to the Third Assessment Report of the Intergovernmental Panel on Climate Change; Cambridge University Press: Jan 1, 01. 3. Abhari, R.; Tomlinson, H. L.; Havlik, P. Z.; Jannasch, N. L. Process for co-producing jet fuel and LPG from renewable sources . USA Oct 1, 2008. 4. Abhari, R.; Havlik, P. Z. Hydrodeoxygenation Process. USA 2009/0163744, Jul 1, 2009. 5. 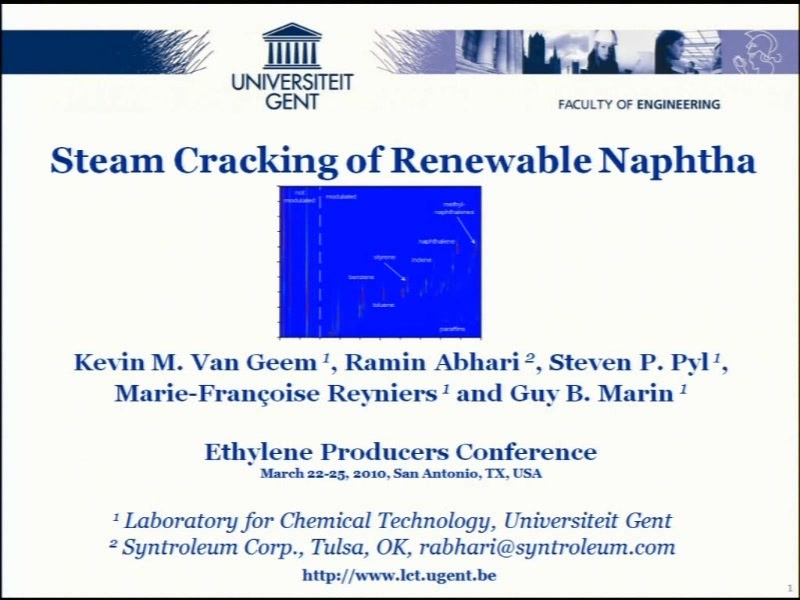 Dhuyvetter, I.; Reyniers, M. F.; Froment, G. F.; Marin, G. B.; Viennet, D. The influence of dimethyl disulfide on naphtha steam cracking. Industrial & Engineering Chemistry Research 2001, 40 (20), 4353-4362. 6. Wang, J. D.; Reyniers, M. F.; Van Geem, K. M.; Marin, G. B. Influence of silicon and silicon/sulfur-containing additives on coke formation during steam cracking of hydrocarbons. Industrial & Engineering Chemistry Research 2008, 47 (5). 7. Van Geem, K. M.; Reyniers, M. F.; Marin, G. B. Challenges of modeling steam cracking of heavy feedstocks. Oil&Gas Science and technology - Revue de l'institut français du pétrole 2008, 63 (1), 79-94. 8. Van Geem, K. M.; Zhou, Z.; Reyniers, M. F.; Marin, G. B. Effect of Operating Conditions and Feedstock Composition on Run lengths of Steam Cracking Coils. AIChE Spring Meeting: Ethylene producers conference; Tampa, FL, USA, 2009. 9. Van Geem, K. M.; Reyniers, M. F.; Marin, G. B. Taking optimal advantage of feedstock flexibility with COILSIM1D. AIChE Spring Meeting: Ethylene producers conference; New Orleans, LA, USA, 2008.